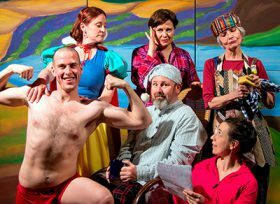 Vanya and Sonia and Masha and Spike (VSMS) is not the twelve-act adaptation of some soul-crushing Russian epic – though it does have its Chekhov influences. Rather, Plosive Production’s VSMS is a two-act comedy about three siblings and their rivalries and squabbles as they live their middle ages. After caring for their parents during some very difficult years, Vanya and Sonia live a retired lifestyle on the family estate. While they seem to have no material wants, after an outburst from Sonia it begins clear that they envy their sister Masha, who went on to live the life of a movie star after their parents developed Alzheimer’s. Top left to right: Teri Loretto-Valentik, Mary Ellis, Beverley Wolfe. Bottom left to right: Drew Moore, Chris Ralph, Sarah Finn. The most memorable performance has to come from Beverley Wolfe, who plays the colourful Cassandra, Vanya and Sonia’s housekeeper who’s part Greek oracle with a dash of Baba Yaga. From Cassandra’s reluctant subservience to her comedic meddling to her sudden oracular prophesies, Wolfe brings a tonne of life not just to her own character but to the entire play as well. Chris Ralph, Mary Ellis, and Teri Loretto-Valentik also performed wonderfully as the ever bickering trio of siblings: Vanya, Sonia, and Masha, respectively. This performance revolves around the interactions of these three, and they play off one another wonderfully. Their banter in the first act is at once familiar — having two siblings myself — and comical with its clash of personalities: the reserved, yet strong-willed Sonia, the vivacious and worldly Masha, and Vanya, the quiet creative who endeavours to keep the peace. They present to us colourful characters who each have their own (not-so) hidden desires, their own nuanced dragon’s to slay. While this first act starts boldly, filled with fiery dialogue and action, the second act doesn’t stand out quite as well. However, this has more to do with the scripting than the acting. For instance, while Ralph pulls it off wonderfully, Vanya’s sudden and unexpected monologue describing the good old imperfect days of national culture and universal experiences – triggered by Spike’s distracted technophilia during the recitation of Vanya’s own play script– seems oddly out of place, since it seems to be a theme that is, at best, only skirted around during the rest the performance. Though it does display a rather interesting disconnect between his own rather juvenile play script and his actual mastery of language. Also, while we all surely over-think our own problems and make things out as being more complicated than the actually are, the conclusion of the second act offers a very simplified resolution to the performance. What seem to be, at first, complex issues stemming from difficulties with interpersonal relationships are all largely boiled down to the effects of one toxic influence. Once this person is vanquished, everyone’s problems seem to be solved. While there are certainly some personal revelations on the part of the three protagonists, the need to soul-search is de-emphasized because so much blame can be shifted to this antagonist. That being said, VSMS is still wonderfully entertaining and definitely rates as one of my personal favourites in the Gladstone season thus far, ranking alongside Whose Afraid of Virginia Woolfe? in terms of comedy and familial dysfunction. If you can, I would most certainly recommend making some time for this performance. But that’s just my opinion and I’d love to know what you think? Was Vanya’s late show tirade out of place or perfectly in character? Which of the three siblings did you relate to the most? Join the discussion and let me know in the comments below.